The development/writing of a procedure requires a format that is easily readable and clearly demonstrates what needs to be done. 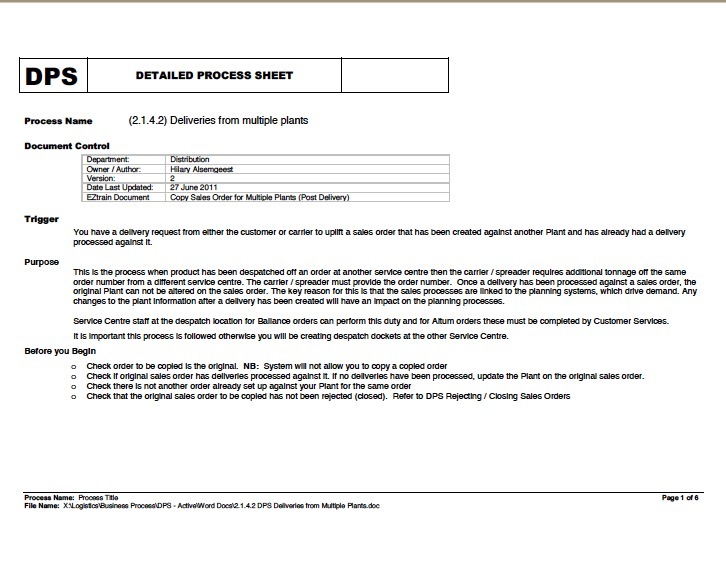 A further requirement that is important is that it will be known as the ‘current best process’ thereby indicating that it can and will be always either updated, changed or discarded depending on the need. We will show two different formats from which you will be able to develop your own format providing you include the important divisions which a document of this sort requires. Below is an example of the template we use in our training. It is a comprehensive document in that it captures all the elements that need to be included – we will give a fuller example of a completed first page. 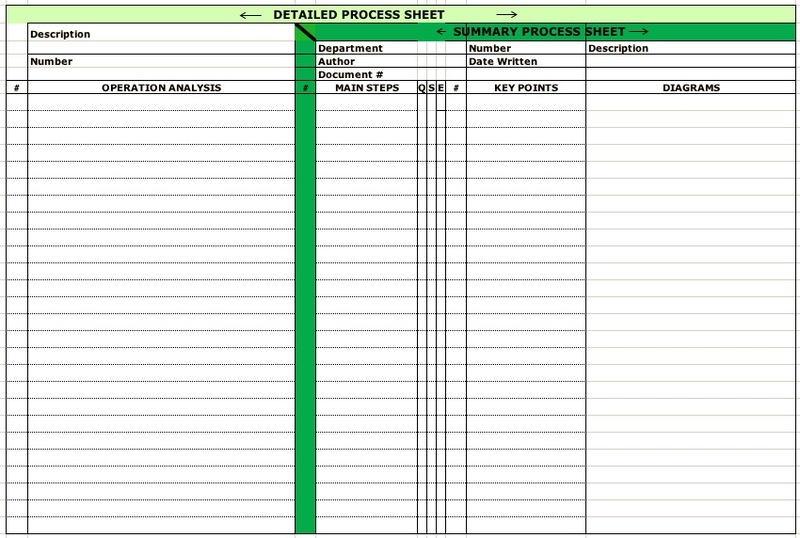 However, you will notice that there is a section called ‘Summary Process Sheet.’ Once the document has been written, this ‘Summary Process Sheet’ section is copied and is displayed at the point where the process is used. It serves as a reminder to the person doing the work of their training and is a reference point for managing that particular process. Note: Main Step # 20 is explained by Operation Analysis # 40 (opposite). The Key Points in doing this is 20.5 and 20.6, and a Picture is shown of the item. The green line after Main Step #20 indicates that this is a complete action. When a department is familiar with and its personnel are well trained, the format of the DPS can be ‘amended’ to show the overall picture. The picture below shows the final assembly run for station #1. The Operation Analysis is concise and the layout clearly complements the instructions #6, 7 etc. This format will not be used to train the operator who is going to do this for the first time. 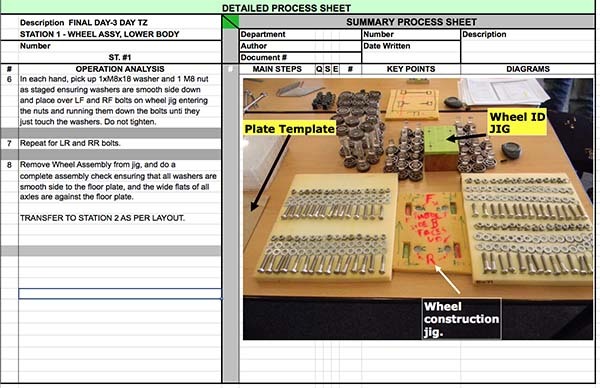 An example of a page of the final DPS – this is for Station #1 of the Try seminar, Wheel Assembly. 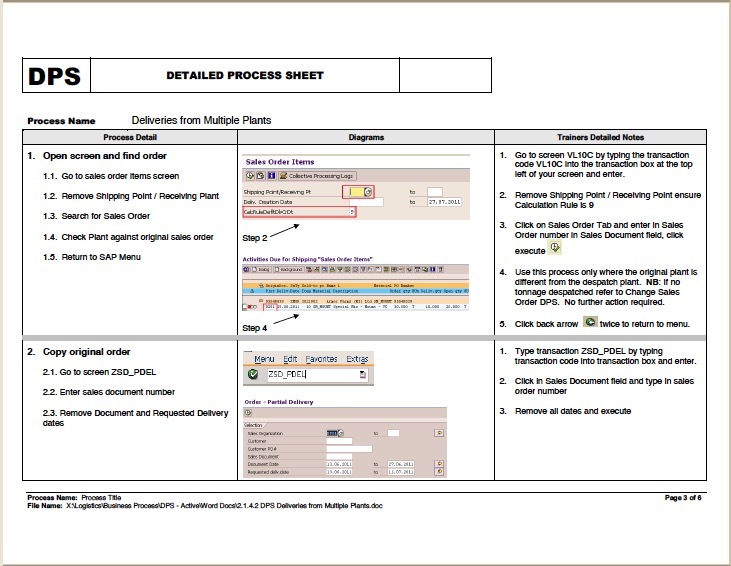 The above example is page 2 of this document and below are the instructions on how to perform the task. An enlargement of Step #1 in this process. Notice the Main Step #1, then the Operation Analysis to do Step #1, then, and this is important, the Key Steps in doing this right the first time. How better to ensure correctness than to capture the process or method in a document that is both the standard and the departure point for continuous improvement? By recording the ‘what’ the ‘how’ and the ‘how well’, your team will have the documentation to produce a quality product or service consistently. 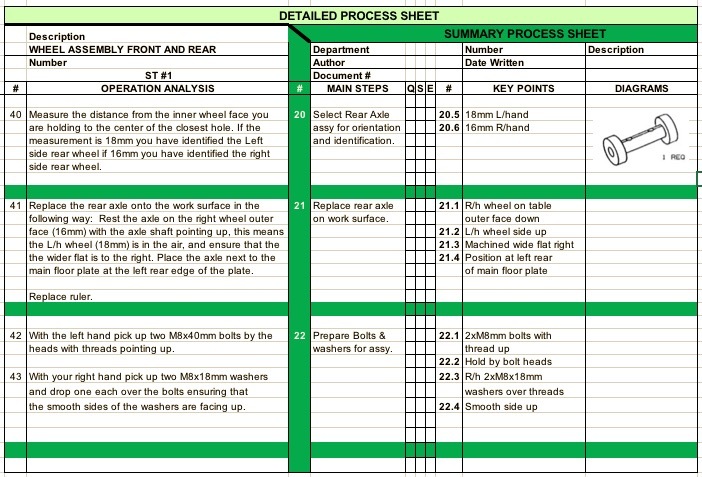 The Detailed Process Sheet is a living document in that once it is implemented as the ‘standard’ for the result, it becomes the basis through which gradual and continuous improvements are built. In the Green Room meeting there is a scrutiny of the document against the results which allows for the improvements that arise through ideas, suggestions and problem solving activity to be written into the document, retrained and monitored. The only way to produce a quality product or service consistently is through a detailed process, written out and followed, without deviation. It must be measured against targets and standards and any variations must be resolved through examination. This examination (Green Room charts) must determine that the process was actually followed as written. Adequate and full training is a prerequisite for proper assessment. Only if the process is found deficient is it examined and possibly improved. Only if a more cost effective and efficient method is suggested and proven (removal of waste etc.) is the process improved or changed. Every improvement requires meticulous attention to detail and thorough training. Otherwise the process stands, as written. Finally, without the focus on the DPS and auditing that a trained and implemented DPS is being followed, the whole Green Area process begins to wind down. The purpose of the Green Area meeting is to measure the process by using data generated as a result of following determined procedures. Apart from a separate training session to understand and develop the Detailed Process Sheets for the company, the first step in introducing QCDSM into a company is the Try Z Seminar. (The link below) It is during this seminar that the participants develop, rewrite and implement DPS documents in order to complete this exciting training session.